We’re still not decided yet whether to dedicate space for this perennial. It’s OK, rhubarb pies are good, but are they good enough—and do we want them often enough?—to justify the effort and ground area? Though we have no information to report till we decide, there is a stunningly complete rhubarb resource on line, linked farther below. 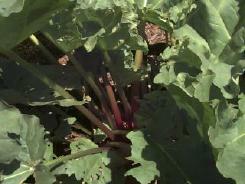 Rhubarb leaves are toxic. And, even though it is the stems that are normally eaten, people with a tendency to rheumatism, arthritis, gout, kidney stones, or hyperacidity should be cautious about eating rhubarb, which can aggravate those conditions. You loaded this page on Friday, 19 April 2019, at 16:15 EDT. It was last modified on Saturday, 2 February 2019, at 19:36 EST.